Tradition in the Here and Now! 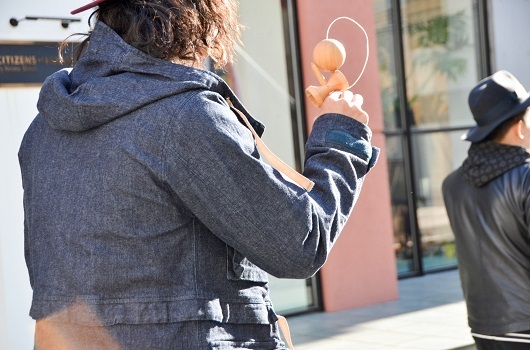 "Street kendama" has been attracting attention in the Japanese media for several years now. 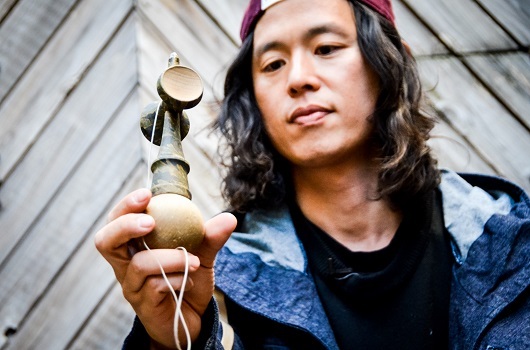 We learn about its appeal from Komoto Nobuaki, the pioneer of a new wave in Japanese kendama play. I tried kendama once in grade school, but was so miserable at it I came away believing it was really difficult. Then I picked it up again four years ago. I'm a BMX rider, and one day for some reason a fellow biker happened to have a kendama in his bag. "OK, so the idea is to get the ball (tama) onto the stick (ken), right? Let's try this." We both started out, holding the kendama or moving our bodies a little differently each time, and in less than an hour I got it. That instant, I could feel something click in my brain--maybe it wasn't so difficult after all! In about a week I'd learned to do quite a few tricks. At the end of that week, my friend and I showed each other our new moves, which turned out to be completely different. We could see there was a lot of room for individuality. That got me hooked. The greatest fun of kendama is figuring out new and original trick combinations. The possibilities are endless. I've been riding BMX since middle school, and in some disciplines in that sport you perform two-minute stunt runs. The fun with those is trying to invent original stunts. That's something that BMX has in common with kendama. Another good thing about kendama is that you only need yourself. You can play it anytime, anywhere! Four years ago my friends and I started talking about making videos of ourselves playing kendama, with cool costumes and locations. Around that time, a few of my BMX buddies were going to the United States, so I told them to let everyone there know about Japanese kendama. Right away they sent back an email:"You won't believe how good Americans already are at kendama! Way better than we are! There's even a team called Kendama USA." No way, I thought at first, but I looked on the Internet and there they were, a group of kendama players posting videos of themselves on YouTube as we were planning to do. What a surprise! Watching the videos, though, I could tell right away that "Hey, they're just like us!" Our approach was the same--combining moves and performing them to look stylish. I don't think there was anyone else in Japan at the time trying to do the same thing. That experience, then, let us know that maybe we were a new presence, which encouraged us to go ahead and spread more notice of what we were about. We created our first video two years ago, and eventually the media picked us up. Nailing a Move Feels Awesome! 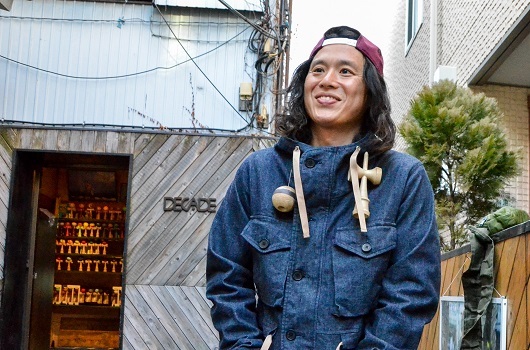 Around then we started offering kendama at our shop Decade Tokyo. Although we dealt mainly in apparel, from before we had also carried BMX bikes, which we would often recommend as a new hobby to our customers. 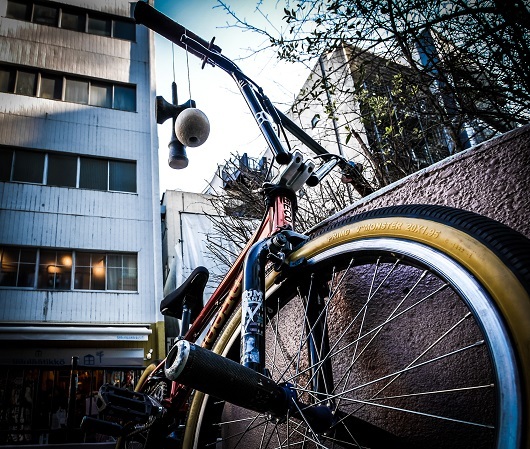 But bikes aren't cheap--30,000 to 40,000 yen--and many people were reluctant to put down that much money. 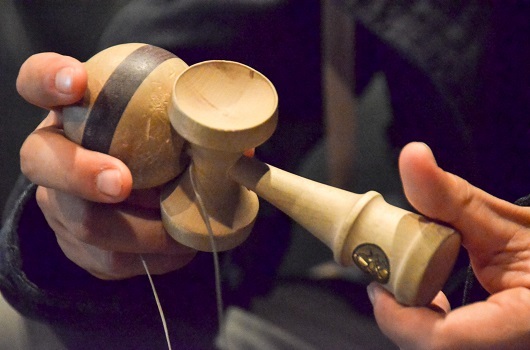 In that respect, kendama was perfect: "Well, it's only 3,000 yen, so it won't hurt me much to try." Of course, like me a few years ago, people tend to have the preconception that they won't be able to do it because they couldn't when they were small. "It'll only take you today to learn. You'll be able to spike the tama, I guarantee it," I encourage them, just to get them to the point of trying. Once they do, they find they really can do it. From there they'll want to do it again, and learn more new tricks, and so on. 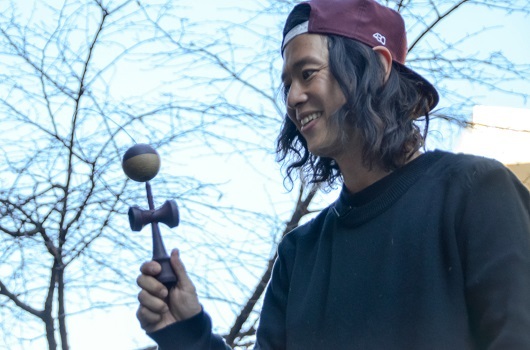 These customers might then show their friends: "Seriously, have you ever tried kendama? It's the best!" Those friends would give it a try, and that's how the boom spread so quickly. Spiking the tama on the ken may look like a challenge, but for grown-ups it's actually not that hard. When I explain how to position the body, how to hold the kendama and at what angle, and how to pull up the ball, most people are able to understand the principles right away. And once they get the hang of one move, others aren't far behind. Take just three months and you're sure to have admiring children calling you a champion. After our media appearances our store began getting visits from kendama fans without much connection to street fashion. They were all a very stimulating group of people. I respected them a lot for their dedication to kendama and their pursuit of the skills. Through our conversations I learned about the Japan Kendama Association. Kendama has been going on quietly but surely for a long time, and I was quite impressed on seeing the level of the infrastructure built up over the years in its support. Eventually I became interested in the association's level certifications. I started taking the tests in 2013, and I'm now at the fourth dan. People who have been practicing kendama since they were very young hold themselves differently from the way I do. They possess excellent form, or kata, as one might say in kendo. This kata is critical to the examinations, since to pass you need precision in each individual move. Players with pleasing form are able to move their bodies exactly the same way, every time. Seen the other way around, what that means is that by copying those movements anyone can become just as good. That's where the kata comes in. A beautiful kata comes from repeating the same movements cleanly over and over, and that, in the end, is the shortest road to success. I think my performance has changed since I've started working on the tests. At the same time that I stay faithful to these basics, though, I want to value my own style. My friends and I didn't begin kendama as children, and you could say that we're outsiders, a part of the "new school." But I believe there are contributions we can make precisely because of this background. 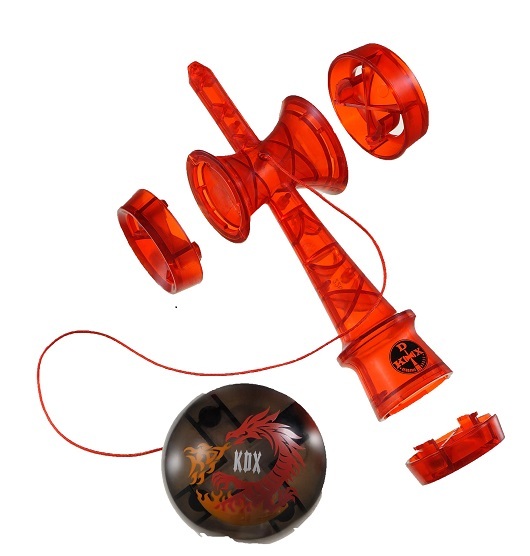 For example, in July 2014 I collaborated with toymaker Bandai on the KDX custom kendama. * It's designed to be easy for children to play, but it's not just kid stuff, either. 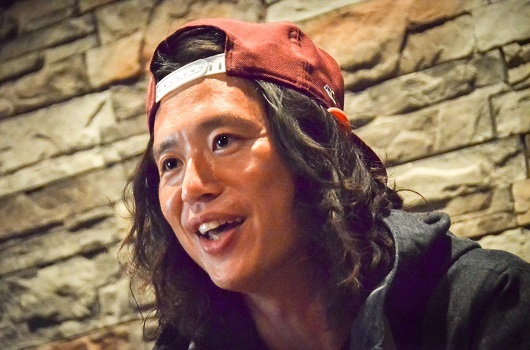 There are many overseas kendama makers now, including more than four in the United States. I think there is a lot I can do across borders to promote the appeal of kendama in Japan while also helping to spread it in other parts of the world. Last year I organized the Catch&Flow kendama tournament with drink manufacturer Red Bull and the G-Shock watch brand. ** Contestants face off one-on-one, and the performer with the hottest act wins. It's the same as what I do with my own friends when we're having fun. I'm sure that from now on people with all kinds of different backgrounds will want to get into kendama. When that happens, I hope that instead of rejecting them, we can welcome the new things they offer and all work together to stimulate an exciting new revolution. I have 150 kendama of my own. This one came into our store yesterday, but already I love it. First of all, the wood is my favorite, zelkova. I've also weighed the three parts and matched them up to the ratio that I like. Just a gram makes a huge difference. If the tama is too light, for example, it won't swing well because I can't find the center of balance. When the tama has a line marked around it, as this one does here, it helps me to gauge the angle, so it's easier for me to tell where the hole is and at what timing I should spike it. I pick different kendama to use depending on the moves I want to perform. 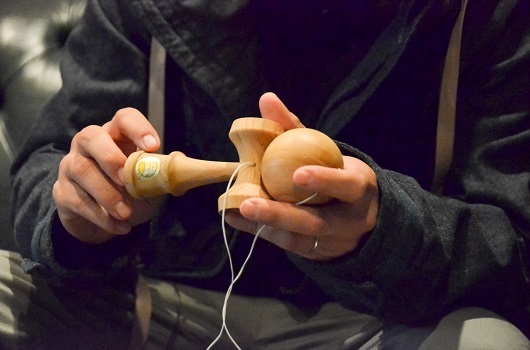 Kendama is not originally from Japan; similar types of toys exist all around the world. 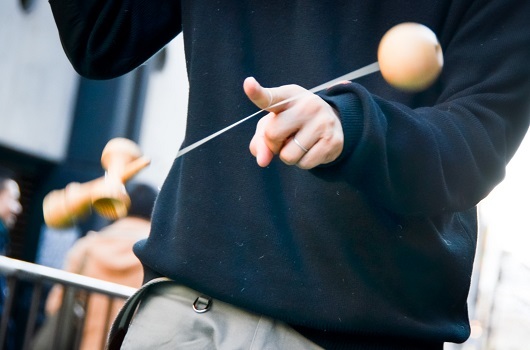 Still, I believe that the Japanese kendama has grown into the way it is today through many long years of being adapted to make it easier to perform tricks. Minor refinements are going on even now. There are slight differences according to maker, as well. For example, two holes may be of the same size but have a differently angled bevel. Three hours is about the longest time I play kendama at one stretch. Even at the shortest, I'll usually keep at it for at least an hour. I get home, and the first thing I do is pick up my kendama. I might fiddle with it a bit before taking a bath. Or while I'm waiting for dinner, even. (laughs) I might try out a new routine I saw a friend post on Facebook, or practice my own favorite tricks. I also use LINE with a group of friends to show one another who's better at doing difficult moves and making the whole sequence look cool. Spreading the circle is much more enjoyable when you can do it while having fun yourself, too. As the number of kendama fans has increased, so have my opportunities to participate in events all over Japan. Last year I visited about forty places. Some events are for playing together with children, others more for grown-ups. It's great fun having the network of people you can play with grow all the time! The other day, I mentioned on Instagram that I was in Kyoto, and someone I'd never even met sent me a message asking where I was. I told him, and he replied, "I'm close by, and I'd love to get together!" So he came over to the yakisoba place I was at. Without kendama I would never have been able to form this kind of community or network. It's truly great how a single communication tool like kendama can bring us all together. I've also been collaborating more with other businesses. Last year I developed a kendama with the Beams fashion brand, and right now I'm involved with Beams and Yahoo! Japan in the "Kendama Tohoku" project to support recovery in the areas affected by the 2011 earthquake and tsunami. We're offering kendama crafted in Yamagata prefecture along with carrying pouches sewn in Ishinomaki, Miyagi, out of indigo-dyed Aizu cotton from Aizu Wakamatsu in Fukushima. Of course, it's not as though this one project is going to generate a huge amount of employment, but my goal is to do my part to help by stirring up interest among as many people as possible. 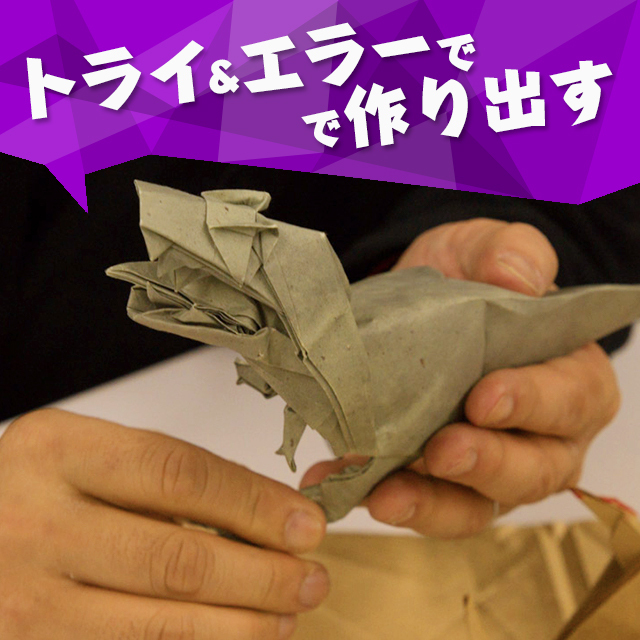 Next year we're planning to expand the project overseas as well. I'm hoping we can get a big movement going!